THE prospects of those qualifying through Highlands and Islands colleges are continuing to increase according to the Scottish Funding Council’s annual College Leaver Destinations report. The publication, released last week, reports on the destinations of those who left college in the 2016 to 2017 academic year. The findings show that 25.9 per cent of leavers from Highlands and Islands colleges went into employment after their studies. This is 5.9 per cent above the national average of 20 per cent and also represents an increase from the previous year’s regional figure of 24.5 per cent. 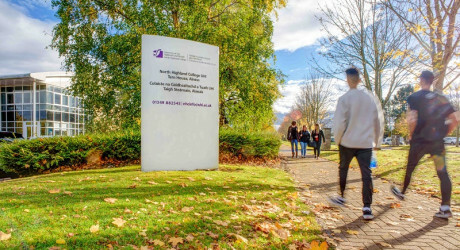 West Highland College UHI and North Highland College UHI were found to have the highest percentage of leavers entering work of all Scotland’s colleges, with over 40 per cent of their former students entering employment. The results for leavers entering work from Argyll College UHI and Shetland College UHI were also significantly above the national average. Including those who went onto further study, 94.8 per cent of leavers from Highlands and Islands were reported to have gone on to positive destinations. The Highlands and Islands further education region consists of North Highland College UHI, Orkney College UHI, Shetland College UHI, Argyll College UHI, West Highland College UHI, Lews Castle College UHI, Moray College UHI, Inverness College UHI and Perth College UHI. The University of the Highlands and Islands Court, through the Further Education Regional Board, is accountable for all college and university-level education in the Highlands and Islands.